Adidas-sponsored ultra runner Brian Tinder is a busy guy. He runs 60 to 70 miles a week and races throughout the year. Together with his wife Shea, they have two kids, Nora, and recently-arrived Charili. Tinder runs a landscaping business in the summer, Stix and Stones Landscaping. And, now, he’s the founder of Arizona Running Adventures, a trail running company that caters to Europeans wanting to run in his home territory, the Southwest, including areas like the Grand Canyon and Sedona. Brian on his way to 3rd place in the October, 2014 U.S. Skyrunning Vertical Kilometer race, in Flagstaff, AZ. Run the Alps’ Doug Mayer talked with Brian the week of the 57 km-long Trail Dents du Midi race, Europe’s oldest mountain race. The race starts and finishes in the mountain village of Champéry, in Switzerland’s Valais, not far from the French border. Run the Alps: This is your first season racing in Europe. What’s it been like? Brian: I had done the Rome marathon in 2012 with my wife Shea, but this is my first time trail racing in the Alps. It’s a totally different animal. The moment I landed, I started to see mountains. At home in Flagstaff, it’ll take eight miles to get in a vertical kilometer of climbing. Here, it can happen in three. It’s hard to find any flat around here! It’s beautiful. I’ve gotten to explore some of the most amazing places: one minute you’re in a dense, dark forest, and the next moment… you pop out in a pasture with sheep, cows, and bells ringing—and a view you can’t even dream of. Run the Alps: What surprised you the most? Brian: When I get up high in Arizona, I’m used to my lungs hurting. Here, you top out at maybe eight thousand feet. As steep as it is, it doesn’t hurt quite as badly. Run the Alps: There’s still plenty of vert, though! Brian: Of course! Here, you can climb for two hours– and then descend for two hours. The Dents du Midi trail race passes by a number of high mountain refuges. First on the list, is Cabane d’Anthème, after an hour climb. Run the Alps: You ran the CCC this year, and finished 22nd in a very competitive field. How’d it go? Brian: It went out fast, with 1,900 runners through a small chute. There were a lot of people going hard out front. It spread out pretty quickly. The scenery was unreal. Pastures, glaciers, herds of cows. I found myself passing old stone ruins and wondering, “Who lived there, hundreds of years ago?” I saw a lot of cows hanging onto 25-degree slopes. European cows are not lazy, that’s for sure. Run the Alps: What was your high point? Brian: Running through the little villages in Switzerland I’d drink from the ancient fountains in the town squares. Seeing the old local residents come out and cheer you on really lifted my spirits. They were yelling, “Bravo! Bravo!” and “Allez, Brian, Allez!” I had forgotten that my name is on my bib! I felt really good in Trient, and thought I could start picking off people. I pushed the pace, but my stomach was acting up. I took a wrong turn, too. Then the rains came, which really put a damper on my mood. Rain, darkness, getting lost… That’s all part of trail racing. When I eventually got back on track, it was hard for me to get back in the game with just 13 kilometers to go. Run the Alps: Okay, gotta ask. What was the low point? Brian: Champex, at the 50-kilometer mark! I was having stomach issues. If I had seen my crew there, I think I would have dropped. I came to the realization that it wasn’t playing out the way I had hoped, in one of the biggest races in Europe. You reach a point, where you have to acknowledge that and move on. I did that. I got to a really happy place and just started enjoying it all—the crowds, the scene. I was grateful for the opportunity given to me by my family and my sponsors. Run the Alps: What was it like, racing against Euro trail runners? Brian: They’re extremely strong. To watch them run up or down, they’re incredibly good mountain runners. They’re very focused. Run the Alps: You’re experiencing that European race energy for the first time. Tell us about that. Brian: It’s something else. People come out of the villages and cheer you on. They give you treats. There’s no trail race in America that compares. It’s like a large marathon… only more so. There’s huge amounts of energy from the crowd. When I started off on CCC in Courmayeur, Italy, there were thousands of people cheering us on. There’s good comaraderie from the other runners, too. It doesn’t matter what language you speak. You’ll all in it together. I’ve finished ultras where you hear one person clapping for you. At the CCC, I finished at Chamonix in the middle of the night in the pouring rain. I didn’t expect anyone to be there. But, there were a couple of hundred people cheering me! When I crossed the finish line, someone handed me a beer. I gave him a big wet kiss. I was so thankful! Run the Alps: What’s your week been like, here in Champéry at Trail Dents-du-Midi? Brian: Absolutely fabulous. I’ve been out here with teammate Connie Gardner, exploring the trails and helping with course marking. We were able to go to Zermatt and see the Matterhorn. That night, we watched the movie of Kilian Jornet on his record ascent of the Matterhorn. Once you’ve seen that mountain, you start to understand just exactly how impressive his accomplishment is. Run the Alps: What’s the running been like? Brian: Anytime you run for an hour in one direction, there’s a refuge or cabin that will serve you coffee, or beer, and a piece of pie. I can’t get over it. I’ve definitely taken advantage of that. Plus, there are waterfalls in all directions! Run the Alps: We’re looking up at the Dents du Midi range right now—the start of the race. What do you think about when you look up there? Brian: The part we’re looking at is about 2,000 feet of very steep forest and pastures. That first climb is going to be close to an hour. The range is just beautiful, too– huge, steep peaks. We’ll be running close to the seven summits of the Dents du Midi range. It’s awesome. I’m really excited. 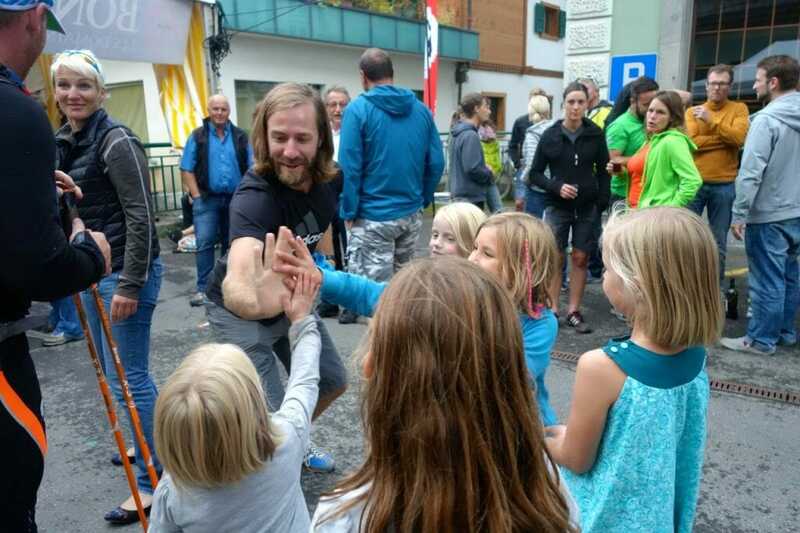 Tinder greets a few of his younger Swiss fans after his race in Champéry, Switzerland. Run the Alps: Ready for the race? Brian: I’ve been doing my homework—looking at past race times, exploring the trails. In an ultra, of course, anything can happen. There will be some great competition tomorrow—people who know the area and are very, very fast. My goal is to be smart, keep them in sight, and try not blow out my quads on the downhills. The course is 57 km, with close to 13,000 feet of climbing. The finishing times are comparable to a fast 50-miler. Run the Alps: There are two technical parts with chains. Brian: I didn’t bring my climbing harness! The most dangerous section is very steep and quite exposed, with a thousand foot drop on one side. You come through a beautiful pass with waterfalls, with snow and glacier nearby. Going down those chains, even if you wanted to run it, it’s not really possible. Run the Alps: You have a lot going on these days. Tell us about your new business, Arizona Running Adventures. Brian: I had a vision for the business. I want to take people out of their elements and into a new location so they can have new experiences. I live in beautiful northern Arizona, where we have the Grand Canyon, Sedona, Flagstaff, and endless mountain trails and Aspen groves. I live on Route 66. It’s the old West. It’s classic. So, I started Arizona Running Adventures to give people a chance to explore these new places. I’m excited about it! It’s not just about new places, either—it’s also about making new relationships and sharing. That’s been a real highlight. Run the Alps: You’re a very grateful person. You’ve mentioned a few times that you have a lot of support behind you. Who are some of those folks? Brian: My sponsors– Adidas, Nathan Sports, New Belgium Brewing Company, Katoola—have all been great. I’ve even been working with Bumble Ride, a baby stroller company. My wife Shea has been incredibly supportive, too. She runs, as well. We take our kids along for runs on urban trails, in the strollers. Bumble Ride strollers are very impressive—they have a great suspension, large wheels, good brakes and a leash system. Our kids really love being in them. Shea and I do a lot of juggling with kids and work. I have a chance these days to see what I can do on the trail running front. So, we decided to go for it and see where it goes. Part two of our visit with Brian will be coming up shortly. We’ll talk with Brian about his experience in the Trail Dents-du-Midi race.